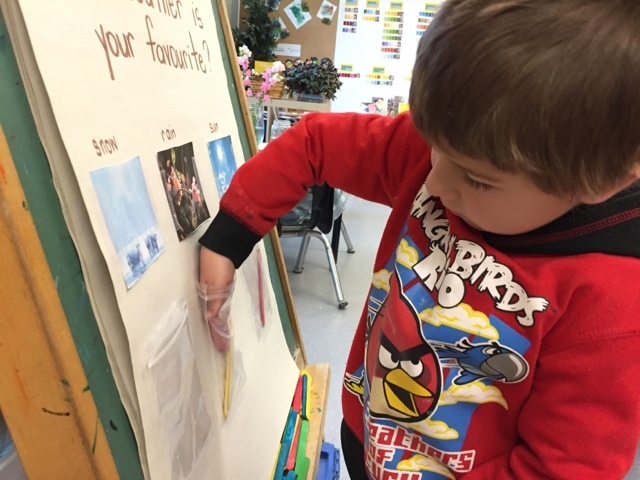 We love having a survey at the snack centre. 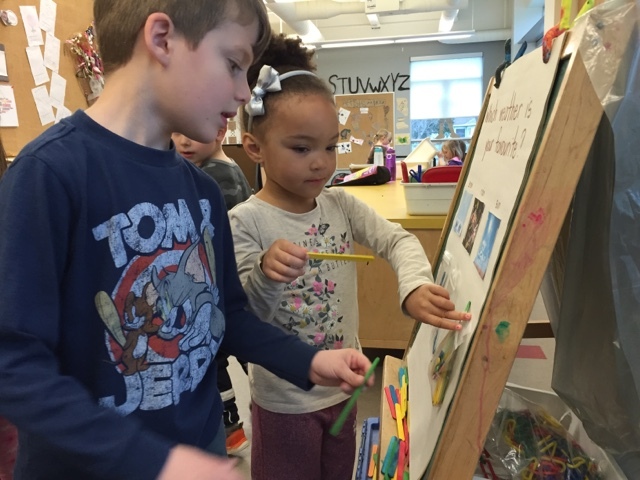 We find it inspires children to engage in discussions with one another regarding the posted question as the question is often written by a child which embeds literacy into the centre, and it's a great way to infuse regular math and math talk into our day. 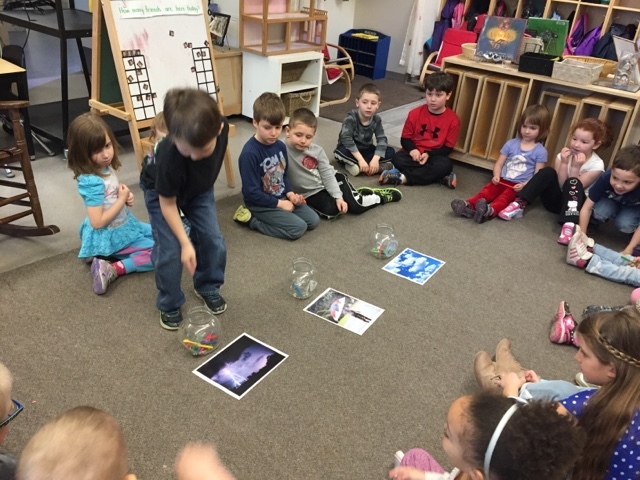 The children have noticed the weather changing as winter fades into spring. 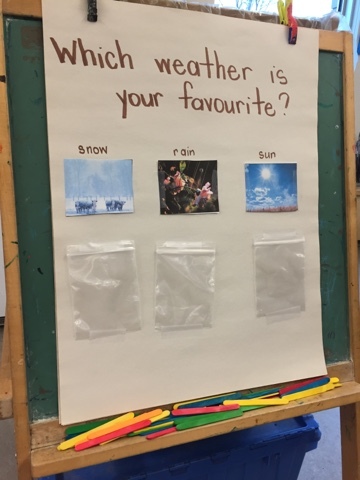 Our snack question asked children to vote for their favourite type of weather. Rather than have children write their names under their choices, we encouraged them instead to indicate their vote with a stick. This way a visual representation of the votes could easily be seen in the clear pockets placed underneath the pictures. 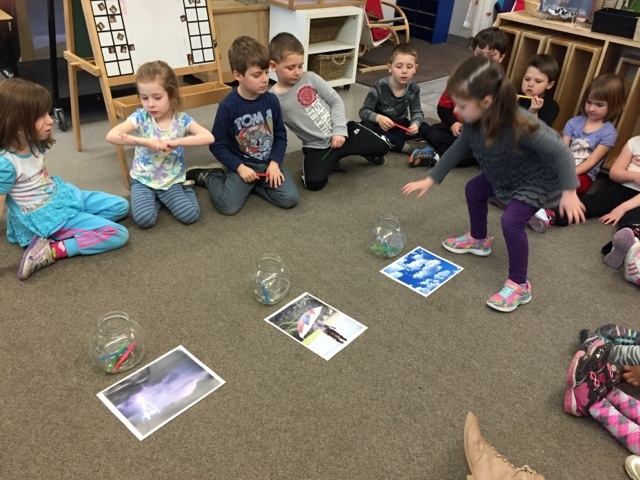 The children figured out the process of how to vote instantly. 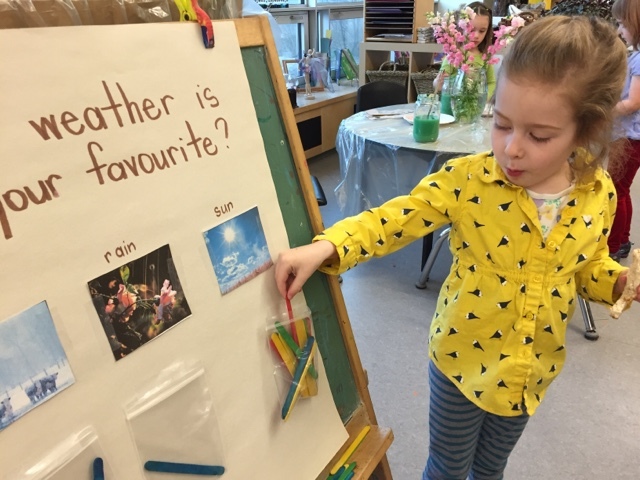 They understood that one vote equalled one stick and that to use more than one wouldn't be an accurate representation of our collective favourite type of weather. 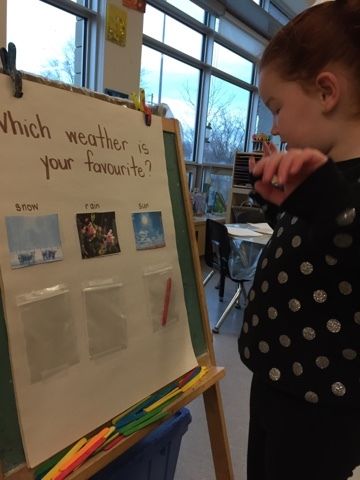 As children took turns voting we overheard rich math discussions; the children discussed the most popular weather type and how many votes they estimated it had. They also noticed that the two least favourite had equal votes. This was an incredibly popular activity that was left out for a few days. Children would revisit it throughout the day to see if the votes had changed and to observe which was the favourite. 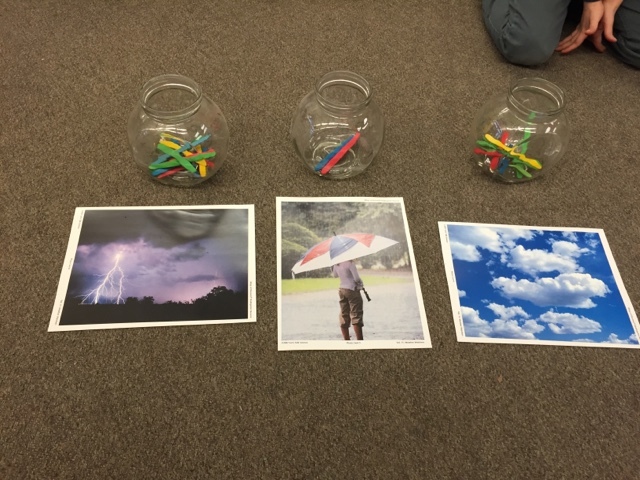 We wanted to capitalize on the children's interest in weather so we modified the activity with some new weather cards for our whole group circle time. 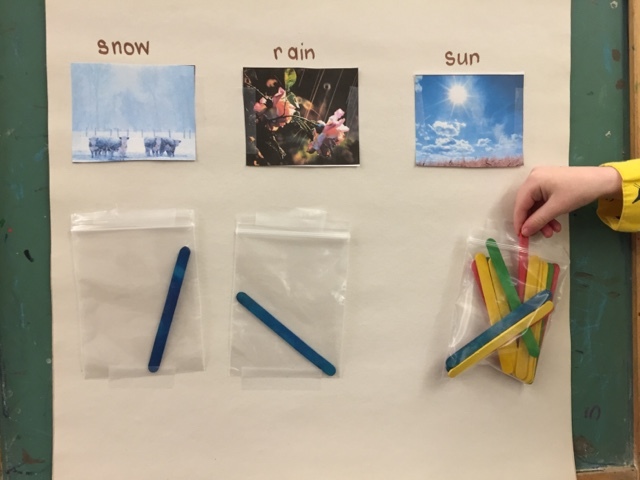 We offered three weather choices again and this time encouraged children to place their popsicle sticks in jars next to the picture. Unlike the snack survey, this vote took place at circle with every child voting one at a time. 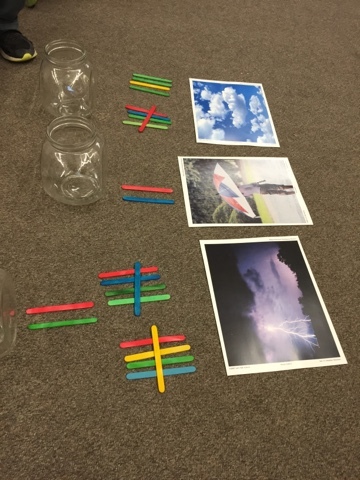 Unlike the first vote, the results for these weather types seemed to be more difficult to assess upon just examining the jars and we encouraged the children to suggest accurate and efficient ways to calculate the votes. 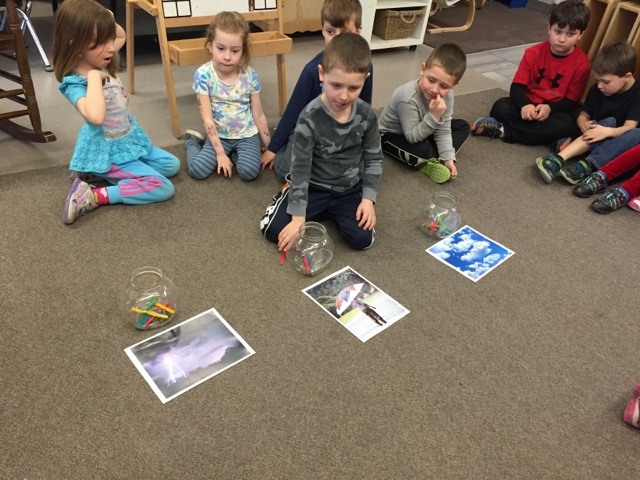 One child suggested organizing the sticks into groups of 5, because 5 was a 'friendly number' (easy to work with because we can skip count by 5s). 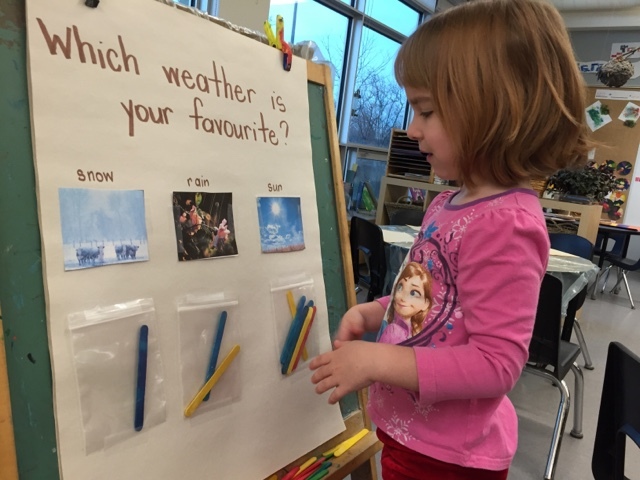 He suggested organizing the sticks into tallies to make it clear to see how many votes each weather type had. 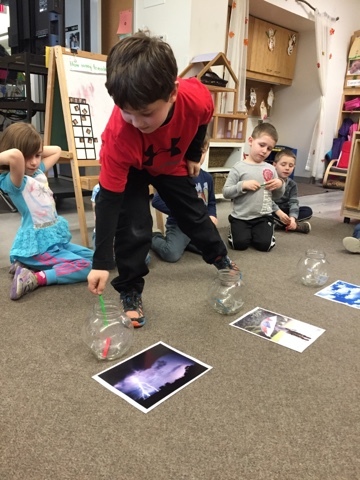 What a fun way to infuse number sense activities (one to one correspondence, subitizing, skip counting, comparing numbers) into an area of interest the children!